With a free hot breakfast seasonal pool and premium cable TV the non-smoking Sleep Inn Aiken makes a fine home base for our guests exploring Thoroughbred country.Each of the 62 rooms in the three-story Sleep Inn includes a microwave refrigerator coffeemaker hairdryer and electric safe. High-tech favorites include complimentary Wi-Fi and premium cable TV with 14 free movie channels. Each morning's hearty hot breakfast is on the house. For fun head outside to the hotel's seasonal outdoor pool. If a more serious workout is on your itinerary ask at the front desk for free passes to a nearby gym. Copy and fax machines are available on-site as is valet laundry service. Small pets are welcome for a fee and parking is free. 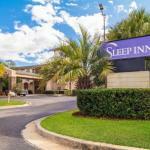 Located just off Aiken's famous Whiskey Road the Sleep Inn is within walking distance of shops and restaurants. Downtown Aiken is less than two miles from the hotel. Hopelands Gardens Palmetto Golf Course the Aiken Thoroughbred Racing Hall of Fame Hitchcock Woods the Aiken Polo fields and Whitney Track are all within a one-mile radius. Augusta National Golf Course and Augusta Regional Airport are both 30 minutes away. Columbia Municipal Airport is 50 miles.